A JAR of rocket pesto in the fridge and you've got the makings of fresh, delicious, quick and easy after-work dinners. 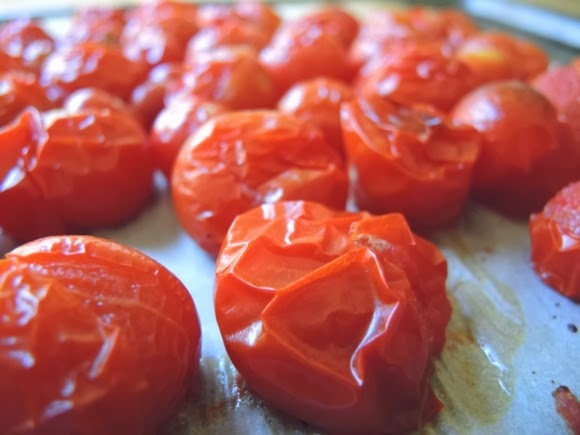 What's even better is if you've got roasted cherry tomatoes, pre done and stowed away in the fridge ready to be zapped in the microwave and, with the pesto, stirred through store bought pasta. What's even better than that is when the produce can be picked from your own garden. Yes, sir-ee. 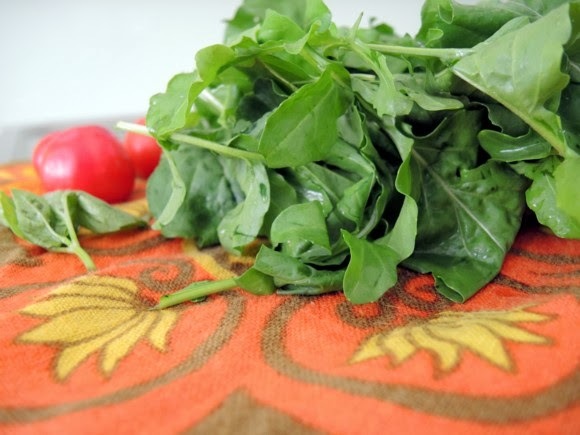 Take a good couple of handfuls of rocket leaves, or basil if that's your preference, and run them through a blender with a couple of tablespoons of olive oil - a light version is lovely - salt, pepper, a shake of capers and the juice of a small lemon. Add about half a cup of parmesan cheese and the same of lightly toasted almonds, or pine nuts if using basil. The capers give the pesto a little zing as does the lemon juice. The extra magic of the lemon juice is it helps the pesto keep its brilliant green colour. My pesto of the moment is a combination of basil, mint and fennel with pine nuts, sunflower and pumpkin seeds. I don't put the cheese in as I find it is more versatile without and I can add cheese later. My current favourite way of eating it is for breakfast with sauteed veg a poached egg and homemade mayo. Or dolloped into the bowl with some miso before adding soup. Yum. Baked eggs, roasted toms and pesto is a bit of a favourite here too. I should do a "how many ways you can eat pesto" post. 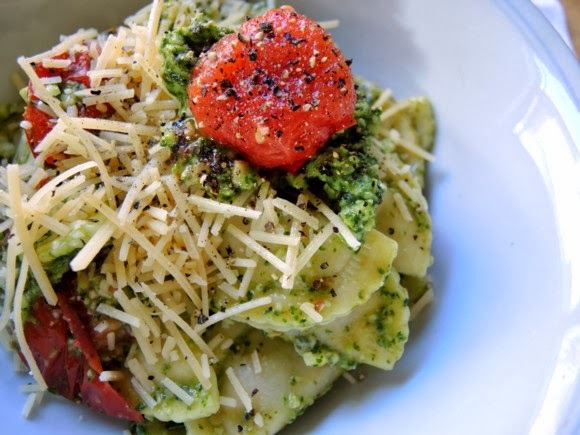 Love that pesto blend you've made. YUM! Get away wif ya! That sounds delicious. YUM! This looks so delicious I could eat a bowl full of it right now, my kind of food! Katie that looks so tasty....how long does the pesto keep in the jar? Have basil and rocket in the vegie garden at the moment, would love to give this a try. 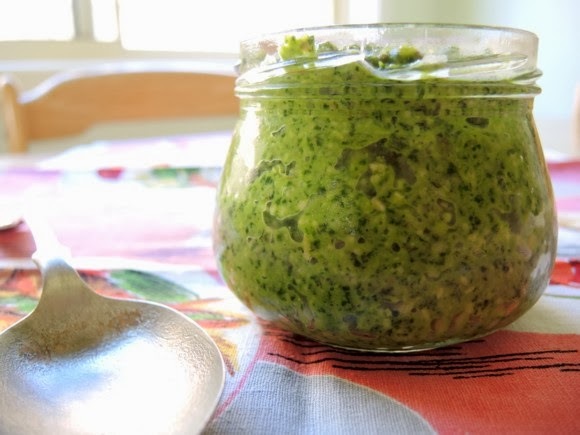 I have had home made pesto in the fridge for two weeks - it was a big batch and I had it stored in a bowl with a thin covering of olive oil and a little plastic wrap over the bowl. This pesto lasted about a week in the fridge and was used across three meals.